The young guns are finding their groove for the Mount St. Mary’s Men’s Basketball team. The Mount has gotten off to a rocky start during the early stretch of road games, but the season is still young, and the team has been navigating its way through the toughest part of its season. Finding rhythm with a new team, a new system, and a new coach is never easy, but the learning process so far has forced the playmakers of The Mount to expedite the feeling-out process and begin learning just how to play Mount St. Mary’s basketball. With the team being entirely comprised of underclassmen, adjustments and team chemistry have to be made and created on the fly, allowing little time to learn systems and strategies necessary to build a competitive team. But under first year head coach Dan Engelstad, the team is coming along just fine, despite what its record may say. 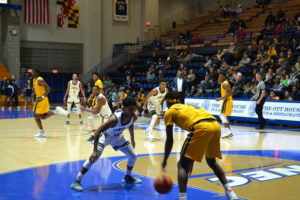 Seven of the Mount’s first eight games have them hitting the road to face off against quality opponents like Maryland and North Carolina State, but the team made its home debut November 21 against the North Carolina A&T Aggies. The Mountaineers’ first half was electric, clawing back to force multiple lead changes and working plays down low to their big forwards for easy scores. The team’s offensive rebounding was causing relentless pressure, and second and third chances for the team’s point scorers to capitalize. Mount forward Nana Opoku was creating havoc down low, snagging everything that came his way, helping Mount St. Mary’s cultivate a 31-27 lead at halftime. Opoku finished the game with 11 points and 9 rebounds, just missing out on completing the double-double. North Carolina A&T came out guns blazing in the second half, though, storming off on a 22-7 run to take a lead they would not give back up for the rest of the game. The Mount had no quit to their game, with freshman guard Vado Morse punishing the Aggies from beyond the arc, hitting 80 percent of his threes to add to his team-leading 17 points. Sophomore guard Jalen Gibbs also had a strong game, sinking 15 points of his own and beginning to develop a strong 1-2 punch with Morse. Despite Morse’s second-half streak, the Aggies’ offense continued rolling, cruising to a 74-60 victory and sending the Mount to 0-5 on the season. Even with the home loss, the team has stretches where the offense looks dominant and the defense is tenacious. The key to getting that first win is the consistency to sustain that pressure for the entirety of the game. As the season progresses on, The Mount will be looking for the home-town crowd to provide the energy that ignited their first-half spark against NC A&T. The team’s next home match tips off Saturday, December 8, against Lehigh University. The Mount’s strong first half defense held North Carolina A&T to just 28 points in the first frame.